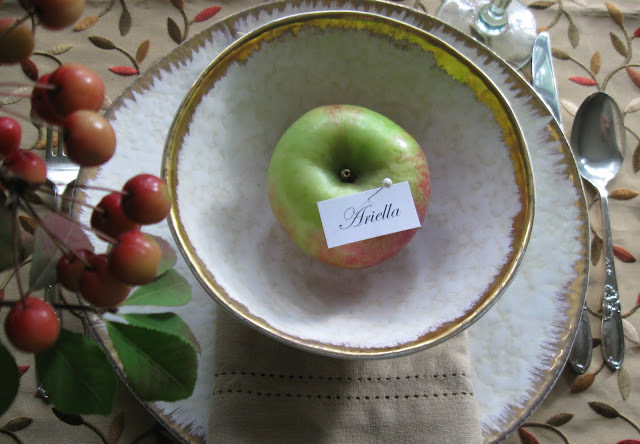 If you're entertaining guests for Rosh Hashanah and are too busy cooking to be spending much time with table decor, here is a super easy but super elegant idea for a place setting. Print out each guest's name on your computer. (I used a script font and cream colored paper to print on). Cut the names into small strips of paper and stick each one into an apple with a straight pin. Not only are your guests provided with a beautiful place setting, but the apple is at hand for slicing and dipping into honey. Love it Rita! Thanks so much for sharing on Craft Schooling Sunday, great to see you back this week!